I used Pillsbury pizza crust, cut in equal squares to make the pull-apart bread. 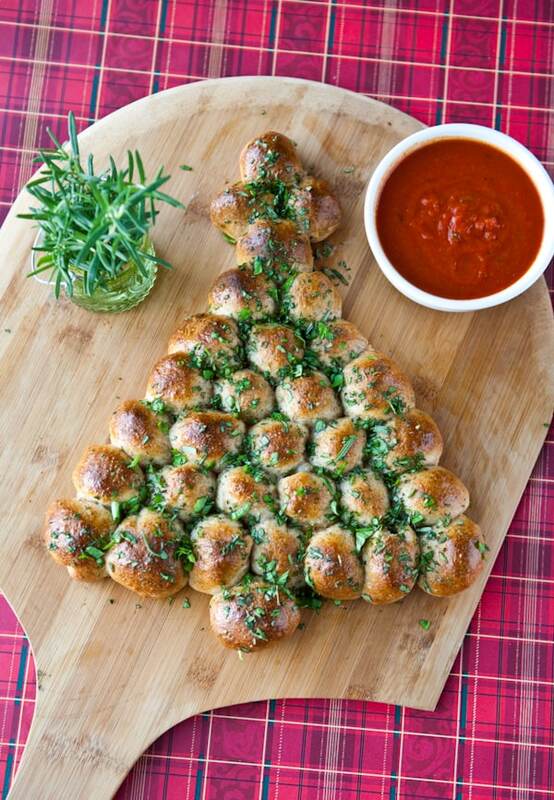 For my tree, I used the Pillsbury’s artisan crust to make it a little more healthy. 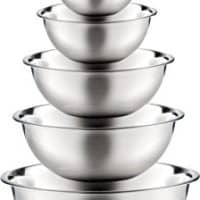 But you can also just use the regular Pillsbury pizza dough, or even a homemade pizza dough. Most grocery stores also now have a fresh pizza dough available for sale in their bakery departments that would work well too. 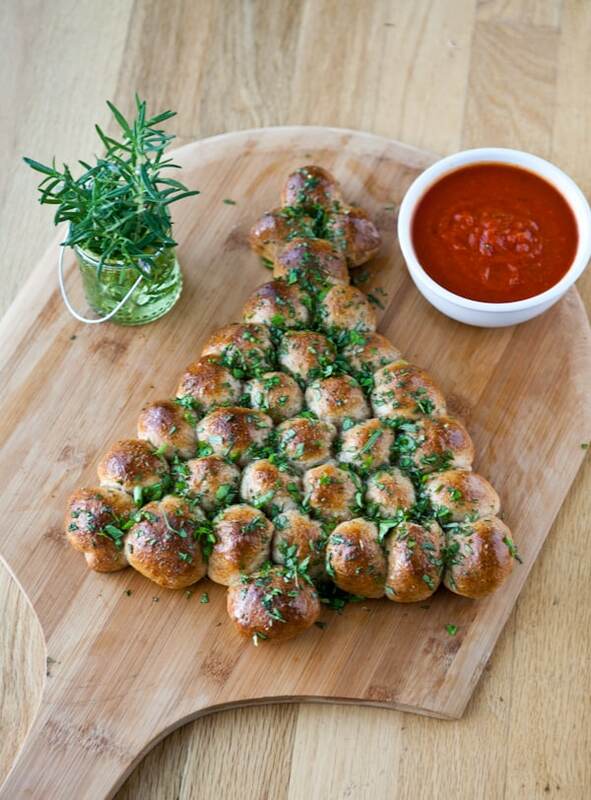 I also stuffed the little dough balls with cheese before forming the dough into the shape of a Christmas tree. For the cheese, I used a combination of cream cheese and shredded Italian Blend cheese. My son had so much fun helping me with this tree too. Kids love to play with dough! After I spooned the cheese filling onto each piece of dough, he helped me form the balls and arrange the dough on the cookie sheet. After baking it, I brushed my tree with melted butter and minced garlic and then sprinkled it with freshly chopped basil and rosemary. You could also use fresh basil and Italian parsley too, or any other combination. It was so easy! For the marinara dipping sauce, I just used my favorite jarred marinara sauce, and heated it before placing it in a small dipping bowl. You can also just use any spaghetti sauce you have in the pantry or a homemade marinara. 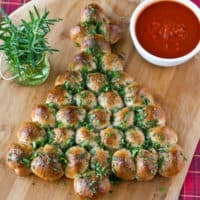 An easy recipe for a cheesy Christmas Tree Pull-Apart perfect to make for holiday get-togethers and parties! OMG I love this, Angie!! Just genius! Merry Christmas to you!! What a great idea! I love this and would love to do this for our family dinner. Thanks for the inspiration and happy holidays to you! So, I have to bring bread tonight to a Christmas dinner. I just added this to my shopping list. Love it! This is adorable, Angie! What a fun treat for the holidays! I wonder if any pizza dough would work? I live in Toronto’s Corso Italia neighbourhood so all the local bakeries also sell balls of raw dough for like $1.50. What was the cheese filling you did? I’m going to make this for my inlaws Christmas – it looks so pretty! I think so. Recipe is added above. Thanks! What a beautiful beautiful treat! Want to eat them all! What a clever idea! I will have to make this for our Christmas dinner. What a great idea! How did you make the cheese filling? And did you roll the balls after you stuffed the rectangles with the filling? Just updated, recipe is added, sorry about that! This is inspired! So simple yet so clever. I love recipes like this – great work! What is black cream cheese? I don’t think I’ve ever heard of that. This is such an adorable idea.. Love it!!!! Merry Christmas hun! This is such a great idea!!!!!!!!! !I’ve never seen something like this.I’m going to get the ingredients to make this in a couple of days. This sounds nice and easy and so yummy. I love the cheese stuffing inside. Will be making it very soon. This sounds really good. Will try it. I love the idea of using this recipe at my Christmas Party!!! A perfect touch for my dinner table! It sounds really good and also simple. What fun….. And such a great idea for a whimsical appetizer…. Thanks! Can this be made a day before? What a wonderful idea! This will be coming to our work Christmas party. Thank you so much. Literally JUST tried this! Grabbed blindly for a can of pizza dough, got thin crust and thought for sure that would ruin it. Nope it seems this is fool proof! I also just cut mozzarella cheese sticks into 3-4 pieces and used that as the cheese. I also popped in a couple slices of pepperoni on half of them and that worked out well too! Again, FOOL PROOF and I love it! I didn’t have fresh herbs so I used some seasonings I usually put into bread dipping sauces and it turned out so tasty. This looks amazing! 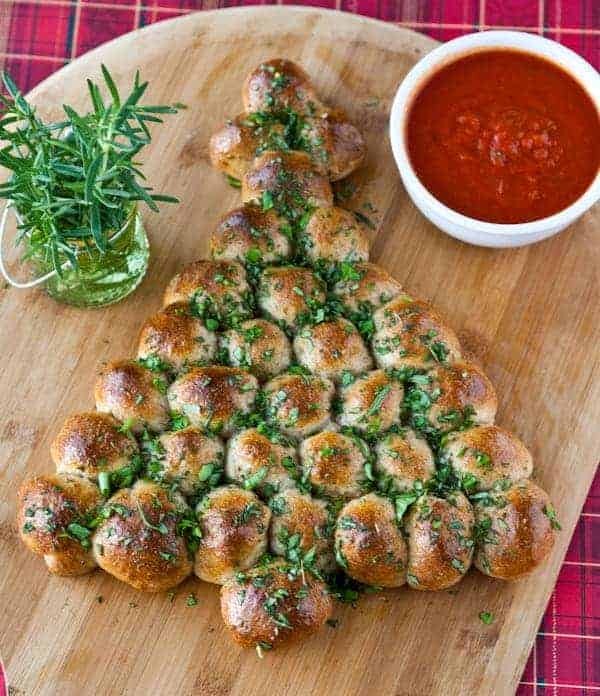 I’m planning on making this for Christmas Eve, but wanted to know if you bake the garlic into the bread or brush it on top after it bakes? i havent tired this yet, but i think it will turn out most deliciously when i do try it with Christmas dinner leftovers, combine turkey,stuffing ,cranberries, and potatoes with some gray to dip them in..mmmmmm going to for sure try this combo!!!!! Who doesn’t love bread and cheese? I think I ‘ll invest the time to make my own dough. Can’t wait to try it. Trying it tonight with trader joe’s dough…no hydrogenated oil then! I’ll let you know how it goes! Made this for Christmas Eve while working on the “7 fishes celebration”…it was gone in 5 minutes!!! We had to make another one! It is much better when done with the artisan crust. Regular Pillsbury pizza dough is thin…it works but not as well! I will be makiing this quite often! Just made this recipe! It’s great, but there are actually 32 balls, not 36, so after I stretched out the dough, I cut it as a 8×4, so make sure you stretch it into an 8×4 rectangle. Before cutting the dough, I spread the cheese mixture over the whole thing which makes forming each ball much easier then scooping. Also, I sprinkled extra shredded cheese on top of the spread cause who doesn’t love extra cheese? For the garlic, try blending it in with the cream cheese and adding a little salt and pepper. It’s delicious! ust made this recipe! It’s great, but there are actually 32 balls, not 36, so after I stretched out the dough, I cut it as a 8×4, so make sure you stretch it into an 8×4 rectangle. Before cutting the dough, I spread the cheese mixture over the whole thing which makes forming each ball much easier then scooping. Also, I sprinkled extra shredded cheese on top of the spread cause who doesn’t love extra cheese? For the garlic, try blending it in with the cream cheese and adding a little salt and pepper. It’s delicious! Looks delicious! What do you do with the minced garlic? It’s not in the instructions. I assume mix it with the cheese? This looks so amazing and delicious! I must make it. I am thinking about taking this to work Christmas party. Do you think it would be OK to make the night before? The instructions for the garlic are in the text of your blog but not the recipe. Raw garlic can kinda bite a bit so maybe melting the butter and garlic together might take the edge off of the garlic. Can’t wait to take this to a potluck, how pretty and fairly easy. Can this be prepared ahead of time and then baked at serve time? Can I make it at the night before and it be kept in thr fridge or freezer? I’m sure you could, the fridge would be better I think. That really looks nice. And what a great idea. Definitely will try this, this year. Loved it and I did it and looked amazing. Wish I cud post the picture to show it to U! Thank U so much ans Merry Christmas! This recipe is great! I started adding some prosciutto to the cheese mix and this year I started adding prosciutto and pancetta. You can probably use pepperoni, ham or any other type of meat you would like to add. It adds a little extra to it. Made for a winter party. Missed Christmas for this. A real hit. Rolled the dough around small mozerella balls. Loved it.